Principal 4 Stopped Flute 4 Harmonic Flute 4 . 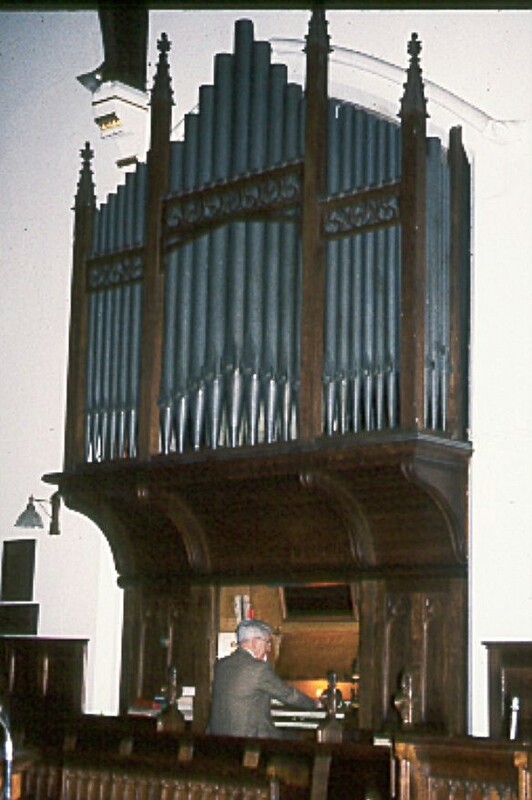 This organ was one of several sizeable instruments built by the Rochdale business for churches in the then Durham diocese, including Whitley [Bay], St.James Morpeth, and Chester le Street Parish Church, seemingly influenced by “tractarian” trends in general and the Rev.J.B.Dykes in particular. The prospects of more work “in the North” and Dykes’s encouragement are said to have brought Thomas Harrison to found the firm of Harrison & Harrison in Durham when the Rochdale business folded in 1872. The Holy Trinity organ is well made, if somewhat confined in its chamber - the Choir division behind the Swell box at the back of the chamber in particular is buried away. It has some lovely tonalities, and “sings” in an unforced way typical of many a Harrison organ up to about 1900 – Harrison was proud to say he’d trained with and learnt about voicing with Father Willis. The Holy Trinity instrument incorporated new pneumatic technologies that do not seem to have worked very well, however. Harrison had to undertake an “overhaul of all mechanisms” [£45], and the appearance of the case was enhanced [£15] in summer 1874. Harrison claimed it was his “pet” organ and would give it personal attention. However, a legal dispute ensued with the Vicar, Rev. A. H. Hughes, about whether the pneumatic pistons were intended to be kept and made to work properly; the Vicar maintained he’d wanted them removed and refused to pay. Butterworth was in charge on site, but there was trouble with some men, whom Harrison had to “summon …for neglect of work”, and which delayed completion.. The organ was to some degree “modernised” and added to in 1901 and 1909 by Nicholson & Lord of Walsall. 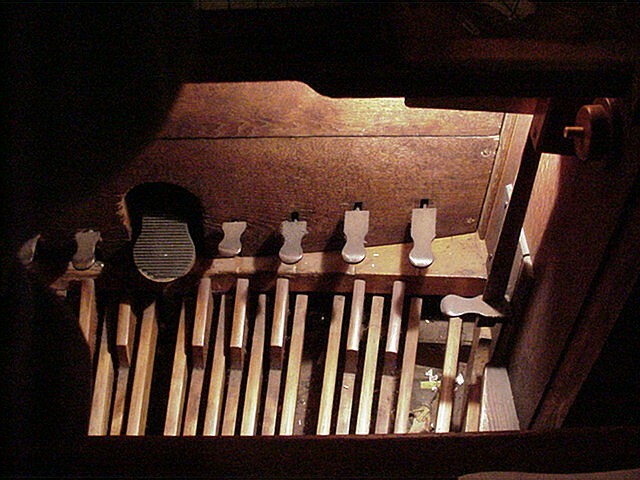 The two Choir Strings were transferred to the Swell, an Open and Dulciana provided in their place on the Choir, and a Resultant 32ft and Trombone (which only works via on/off pistons) added on the Pedal. The refitted console, balanced swell and R&C pedalboard (but original compass) appear to date from this time. H.E.Prested of Durham undertook releathering and refurbishment work in 1972. 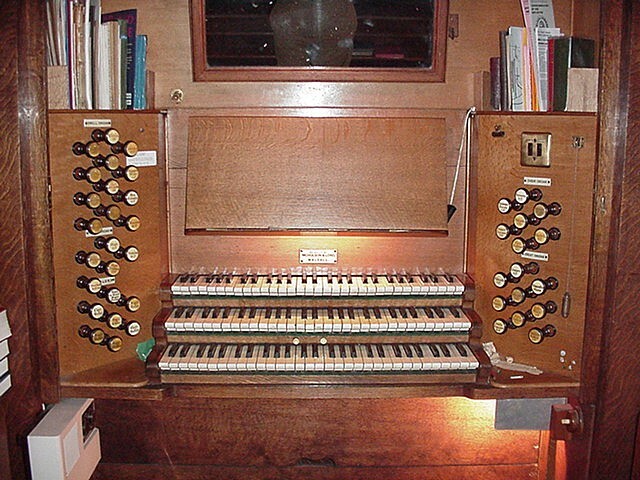 Today, the organ retains much of its integrity as an early Harrison instrument, and I believe still gives a good account of itself, if increasingly in need of thorough-going restoration. 1. The Holy Trinity organist James Hoggett, was the son of George Hoggett, a music dealer and small-time organ-builder of Northumberland Place, Darlington. James described himself as a Professor of Music and music seller, of Northgate, Darlington. Another son, Christopher established a “music warehouse” in West Hartlepool and acted as an agent for Harrison in that area, and his son George [jnr] was running another music warehouse in [Old] Hartlepool in 1873.